This Apple Mac Mini (Late 2012) is powered by an Ivy Bridge dual core 22-nm i5-3210M Intel processor with 3 MB L3 cache, Turbo Boost dynamic performance up to 3.1GHz and Hyper Threading technology for up to 4 virtual cores. The Late-2012 models introduce USB 3 ports, faster processors and memory. It includes 4 GB of 1600 MHz DDR3 PC3-12800 ECC memory installed as two 2GB SO-DIMM modules, a 500GB Apple OEM HD, and Intel HD Graphics 4000 that shares system memory with the system and can support one display at a resolution of 2560x1600 via the Thunderbolt port, and/or one display at a resolution of 1920x1200 via the HDMI port. Connections include four USB 3.0 ports, one Firewire 800 ports, an SDXC card slot, minijacks for stereo line-level input and output, a Thunderbolt port that supports data transfer at rates up to 10Gbps and supports an external display at a maximum resolution of 2560x1600, and an HDMI port that supports an external display at 1920x1200. 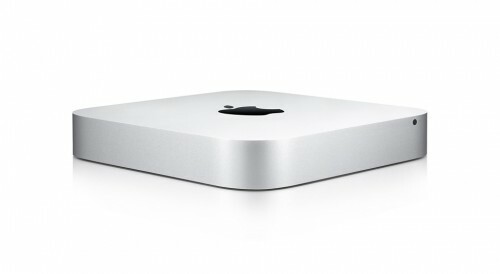 The Late-2012 Mac Mini models initially came with Mac OS X 10.8 Mountain Lion installed. They were released on October 23rd 2012 and discontinued on October 16th 2014. This Apple Mac Mini is in perfect working order and good condition with marks from previous use. It comes with your choice of OS X installed and a power cord.